Had a lovely week. Worked in the tasting room several days and enjoyed conversations with many visitors from the States and beyond, especially fellow Brits. Everyone is always interested in my story and how I come to be working with tea. What a great life, making conversation and drinking tea. Talking of Brits I got to serve tea to the Iron Lady herself! (just in case you thought I was being serious, the lady was an actor) Margaret Thatcher was the theme at the afternoon tea which was to benefit the Women’s Resource Center. Our gracious hostess had a magnificent penthouse overlooking the bay and tea and food was served on a collection of exquisite china. Iced Peach Paradise was set on the table in wine goblets (looked beautiful) When the ladies started eating sandwiches, our Margaret’s Hope Darjeeling was served and with desserts I served Goji Green tea. The tea was very well received. Why am I sounding so surprised, all of the loose leaf teas offered at Local Tea Company are delicious! Sip Locally with your very own Tea Lady at the gardens. Stay Cool. I like the way this sounds so I am going to blab about brewing. So many visitors to the CarriageHouse Tea Room at Selby Gardens are confused about how to brew tea. I hope this helps. Let’s start with the Kettle, used only to heat water. There are some great models on the market which switch off when boiling point is reached. There is even one with a thermometer so you can catch the water before boiling point is reached, when making green or white tea. A Tea pot is the vessel in which the tea is made. You may brew directly in a cup or mug, but I love my tea pots. I always warm the pot with boiling water before adding the tea. After I pour out the heating water, I add the tea to the wet pot and after a minute or so I inhale deeply. As the leaves start to open, the aroma from these warm environs is fantastic and hints at the pleasure soon to come. Use a teaspoon for each cup of tea you want to prepare. My mum used to say “and one for the pot” and my husband and I still always add an extra teaspoon of tea when we brew a pot. A teaspoon is different for each kind of tea, as teas come in many shapes and sizes. Not to fret, you will soon get accustomed to the amount of tea you prefer, as you brew more tea. Experiment, though it is not an exact science, have fun. Steep your tea for the recommended time; white and green tea 2 to 3 minutes, black tea 4 to 6 minutes, and tisanes 8 to 10 minutes, though again personal preference is the rule. While I use a timer in the tasting room to bring garden visitors the perfect taste, at home I just look at the color of the liquor and guess! Many tea pots have Infusers, mesh baskets to hold the loose tea or Strainers, to keep the leaves in the pot and out of your cup. I like to let the leaves move around in the pot, and with glass pots it can be quite a show. Loose leaf tea holds a lot of flavors and I always recommend multiple steeping. Add more boiling water to the leaves and double the steeping time. Your second cuppa will not be as strong as your first, but I cannot bear the thought of throwing away tea leaves with even a bit of flavor. If you don’t plan to drink multiple cups, put the tea pot in your fridge and enjoy the tea over ice. This afternoon I am brewing my favorite Oolong and will infuse the leaves at least four times before the leaves are laid to rest in my garden, but that’s another posting. Sit back and enjoy the perfect cup of tea. Remember the journey is just as important as the destination. I hope this helps. This ceremony was not as rigid as the Japanese Tea Ceremony [Chanoyu] but more formal than the Chinese Tea Ceremony [Chongu Cha]. Kim was very passionate in her presentation of the Korean Way of Tea or Panyaro, explaining tea is an important part of reclaiming the true heritage of the Koreans. After the Japanese invaded Korea in 1910, many traditions and aspects of Korean cultural were lost, systematically wiped out by the invaders. Some writings survived in remote monasteries and from these historical relics Panyaro, the Korean Way of Tea has been revived. Hyo Dang initiated the revival and wrote the first full length study of tea in modern Korea. The ceremony is an expression of the graceful way of life with peace and understanding in accompanying each cup of tea. As with the previous ceremonies, Kim’s costume was beautiful (see the photo below). she knelt for the ceremony and the four guests, myself included tried to remain in the same position. It proved more difficult for all of us! Each movement was performed slowly and precisely. Kim returned her hands to her lap after each movement. The tea items were covered with a cloth, red on one side representing the earth and blue on the other, representing the sky. Hot water in a large teapot was poured into a bowl. The tea cups were each filled with hot water to warm them. Each time the bowl was lifted she used a small napkin to wipe the bamboo scoop before placing the tea into the teapot. The water was removed from the cups and each filled with a small amount of tea. Kim kept going back up the line again until each tea cup was filled. With the same precise movements Kim placed each cup on a saucer and presented the cup to each of us. When she indicated, we all sipped together. The cloth was placed on the cups and pots after we had finished our tea, we all bowed and with great relief stretched out our legs! Here is a photo of me and Kim after the last ceremony. What a great day at Selby Gardens and a fantastic experience. So different from the English ritual of taking tea and yet in so many ways the same. My thought was that regardless of how you take your tea, make it special every time and embrace the moment. Local Tea Company was a proud sponsor of all three Tea Ceremonies at the Asian Cultural Festival. The Japanese Tea Ceremony was a much more complex, absorbing and meditative than the Chinese Tea Ceremony [Chongu Cha]. Through tea every human encounter is recognized as a single occasion which cannot be repeated. As such, every aspect of the ceremony must be savored as nothing is permanent. Seek beauty with your mind and heart and cherish the moment. Tea culture is “god like” and referred to as Teaism in Japan. The ceremony takes place in a designated room, in our case defined by bamboo mats with shoes removed. 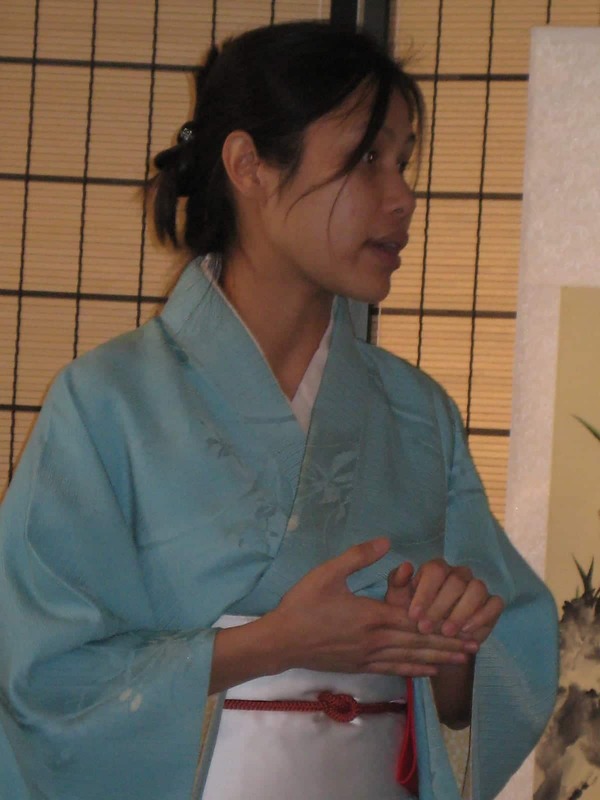 Kim wore a simple creamy blue kimono. Usually up to four guests participate, and on Saturday Michael was the honored guest. He entered the ceremony by crawling through an imaginary tunnel to signify leaving any material items outside of the tea ceremony, as all are equal regardless of status or social position. No words are spoken. Water is held in a stone jar and touched only by the host. Water represents Yin and the heat of the fire, Yang. The container symbolizes purity. A sweet is served to the guest as the host uses a fine silk cloth or Fukusa to wipe the ceramic jar. The Fukusa is carefully folded after each movement and requires a high level of concentration or state of meditation. The tea bowl and whisk are rinsed and wiped. The water is poured to represent a waterfall. The tea, in this case a matcha is scooped and whisked, then presented to the guest with a bow. The tea ware does not match and the tea bowl is usually a cherished item of the host and represents the moon (yin). It is placed next to the water container which represents the sun (yang). The bowl is wiped and turned after each guest drinks, though host does not drink any tea. 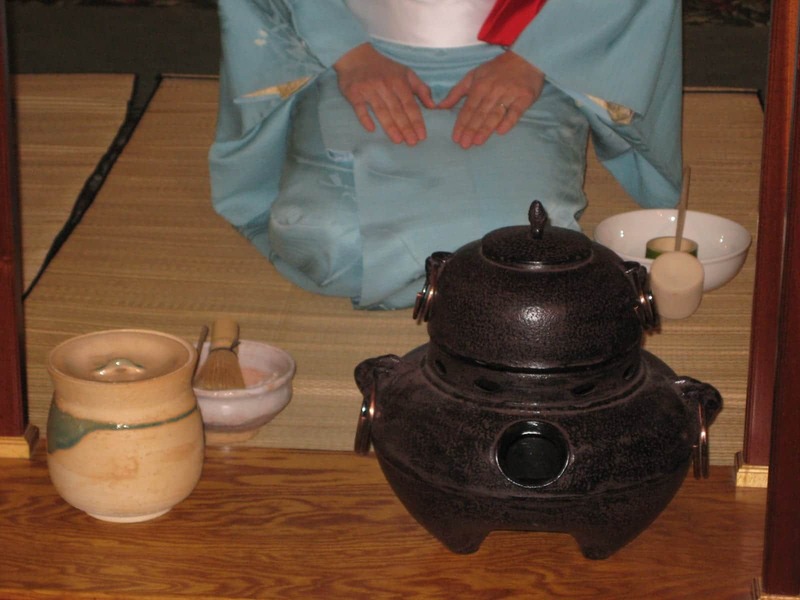 The Japanese Tea Ceremony is a gift to the guest, a gesture of love or respect. We had a crowd of well over 100 at the Activity Center at Selby Gardens for the Asian Cultural Festival. The tea ceremonies were sponsored by Local Tea Company. Kim answered many questions and was simply fabulous. Next, I will post notes from the Korean Tea Ceremony soon. This last weekend was the Asian Cultural Festival at Selby Gardens. The event was packed with uniquely Asian activities; bonsai displays, martial arts performers, taiko drummers, and other dancers. 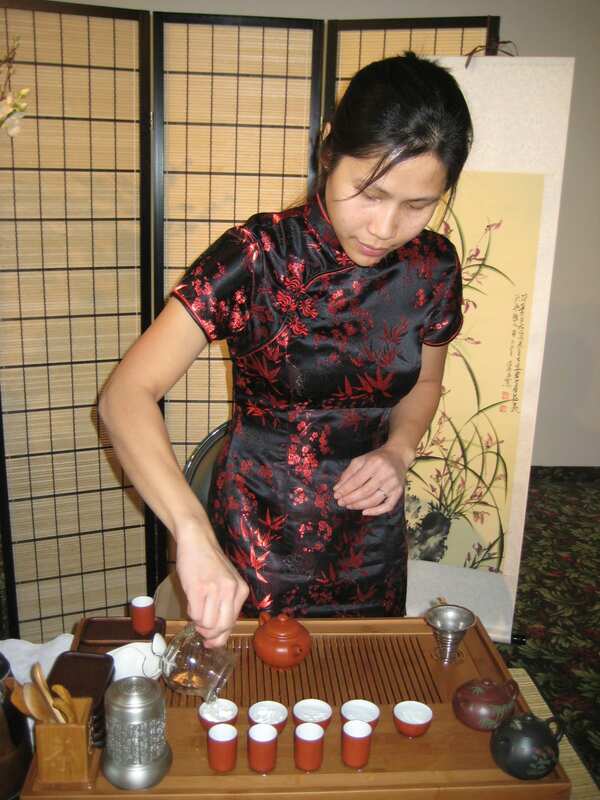 On Saturday, Local Tea Company sponsored 3 tea ceremonies – Chinese, Japanese and Korean. I enjoyed all three and participated in the Korean Tea Ceremony. I’ll share the details here along with a few pictures. 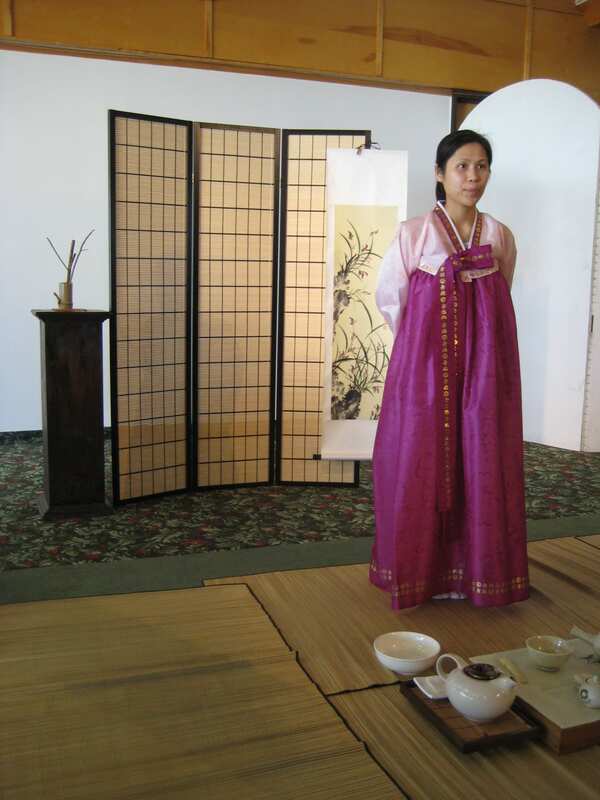 Kim Phram resented all three ceremonies in traditional attire and using proper tea accessories and authentic teas. She owns Kaleisia Tea Lounge in Tampa. Kim was fantastic, very knowledgeable and thrilled to share the history and details with all that attended. 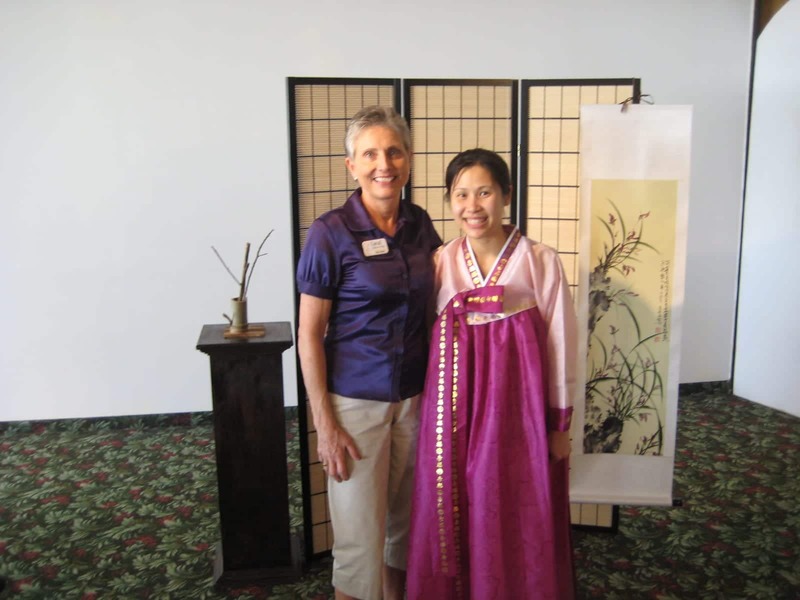 Kim is a true student of tea ceremonies. I will break the details into 3 posts. Gongfu Cha, the Chinese ceremony was first at 11am. This style of ceremony is all about the tea, what it tastes like and smells like. The audience was encouraged to ask questions and Kim talked all the way through describing the ceremony as “tea with friends”. Each step is meant to be a sensory exploration and appreciation. 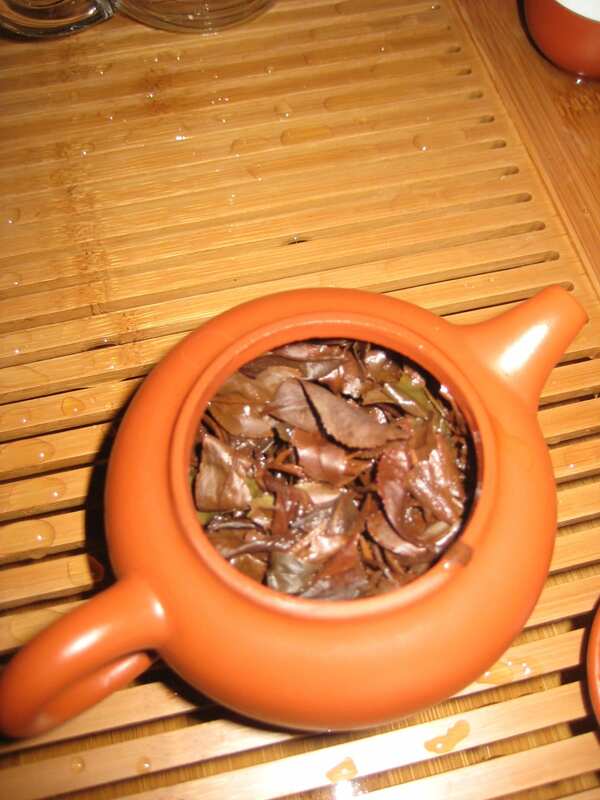 A very small un-glazed clay teapot, yixing was filled a third full of tea for multiple, quick infusions. The pot and small drinking cups were all rinsed with boiling water first then the tea was rinsed or flushed. The first infusion was only 30 seconds. Kim explained the tea came from a wild tea plant in the Yunnan Province of China and was bought directly from a farmer. She calls it ‘No Name’ tea because this is tea the family drinks and has no name. Very special tea, sweet and delicious. And Kim wore a traditional Chinese special occasion dress of silk, but back to the Gongfu Cha. The tea is poured in a continual motion over each cup so all are filled together and taste the same. There are 2 cups with the larger is called the “snifter”. This was tipped upside down releasing tea into the small drinking cups, about 2 sips worth. Then the snifter is smelled to appreciate the aroma. Kim moved everything using bamboo chopsticks. Typically up to five infusions are made from the same leaves, adding 10 seconds of steep each time. I was asked again this week about Chamomile tea and as this has never been one of my favorite teas. I thought it was used as a sleep aid, and I just had to find out why it is such a popular beverage. Well, I found some information that has really perked my interest and I might even be contemplating adding Chamomile to the pot! The Chamomile plant (Matricaria recutita) is native to Europe, North Africa and the Mediterranean region and has a long history as a mild botanical. It is safe to use for long periods of time without any adverse effects, although you are as always advised to consult your doctor. Science Daily cites a study where researchers found over a 2 week period chamomile tea drinkers experienced increased anti-bacterial activity in their urine. In simple terms this means that chamomile can boost your immune system and fight illness. The study also found an increase in amino acids that help alleviate muscle spasms and relax nerves. Chamomile can help people suffering from stress, spasms and cramps as well as intestinal discomfort and the reduction of gas. It is recommended that you drink chamomile tea after meals to alleviate these symptoms. Can I be converted to a Chamomile drinking tea lady? Perhaps, now that I know how this herbal tea can be used. While sampling our iced Earl Grey, a customer told me she had read that Bergamot was bad for you. How can the most popular flavored tea in the world possibly have an ingredient that is bad for you, I thought? Wanting to prove that theory very wrong I found some interesting facts. Though I’ll tell you about our iced Earl Grey later. Bergamot is a small, pear shaped citrus native to southeast Asia but now commercially grown in Calabria, Italy. The fruit thrives in the calabrian coast and is the symbol of the region. Like most citrus, I am sure it makes an excellent marmalade, though my Key Lime marmalade would be hard to top, but I digress. Used in half of women’s perfumes and in aromatherapy to treat depression and aid digestion, I couldn’t find much negative press. Extract from the bergamot plant was used in sunscreens but was banned in 1995, this did not make sense to me, then I found comments that bergamot blocked absorption of potassium in intestines. Why would it be used as a digestive aid then? I found that various North American plants of the mint family are also called bergamot due to their fragrance. One was used to make a beverage by the American Indian Oswego tribe and was adopted by the 18th century colonists during their boycott of British teas! We won’t get into that now though! The worst info I found was that Bergamot has been used in Witchcraft. Maybe it cast a spell on all those people who think it is the best tasting tea ever! Are you spellbound? On Sunday dawned the day I was to serve tea to the biggest tea party I have ever been involved with! This was definitely a first in my tea journey. The occasion was to celebrate and give thanks to the Associates of Selby Gardens, all 110 of them and a bunch of tea lovers to boot! Not only that, they wanted the “Champagne of tea” Darjeeling. We selected a beautiful tea from the Tukdah Estate which was a first flush TGFOP. I just could not mess this one up! So, my dilemma. How to serve the perfect tasting, piping hot cup of tea to all these people? How much to make, what time to start brewing? When it boils down to it (sorry!) you just have to replicate what you do best when you are making tea for two. So that is just what I did, along with some helpers of course. I got together all the containers (one of these was a Silver Samovar which looked fabulous) we were using, weighed the tea in correct proportions and got the kettles boiling! We steeped the leaves twice, first for 3 mins and second for 6 mins which in my experience gives a well balanced taste. It took one and a half hours to complete the process. We delivered the tea to another building (no easy fete over the brick paving’s in the garden) where it was decanted into very nice Silver teapots owned by some of the Associates. The tables were served tea in turn as the guests were invited to the buffet table. Each server came back for more and more tea! It was a brilliant feeling seeing all those people slurping Darjeeling (sorry, associates don’t slurp but you know what I mean) which was hot and tasted perfect too! We had plenty for everyone and very little left which is also good. It was great to receive such good comments and no negatives. Then you start to ask yourself, why did I worry so much? “If you say you can, you will” is a great motto and one which is working well for me this month, stir in a little love and you have the perfect cups of tea. So, if you are planning a BIG tea party call yours truly. February 2009 certainly got off to a busy start in my tea world! Last Thursday we had our first Tea Appreciation course at Selby Gardens as part of the Sarasota County Adult Learning Education Program. From the second floor of the Payne Mansion with a wonderful view of Sarasota Bay, with the sun dazzling on the water and shining on the Ringling Bridge. Does this sound amazing? It was! The picture perfect tea morning, bright and sunny but on the cool side for us wimps in Florida. I had 16 lovely ladies attend. (Come on you tea loving guys, there must be some of you out there!) During our 90 minutes together we tasted 6 different teas; 2 black, 2 green and 2 herbals. We discussed origin, processing, preparation and health benefits of each tea. There was time for lots of questions and some lively discussion about brewing the perfect cuppa. I must not forget to thank my excellent cha walla Michael, who served the tea in true airline stewardess fashion! In Indian families ‘cha walla’ is used as a term of endearment to encourage a fellow member of the family to make the tea. Also a term used in the film “Slumdog Millionaire” for the hero Jamil Malik but not with the same endearment! The ladies, as ladies are wont to do then proceeded to our Tasting Room to sample 3 more teas. During the afternoon we had 3 more ladies attend and had an “unplugged version” of the same class. Very up close and personal but just as much fun. A brilliant start to the month. Watch this space, we are planning more Tea Appreciation and other Tea associated classes in the coming months and it would be great to have you join us. At our booth at the Downtown Sarasota Farmer’s Market, someone asked for Holy Basil tea. I was not familiar with this tea and did some research that you may find interesting. Holy Basil or the Tulsi plant is called Holy as it is an important symbol in the Hindu religion. Tulsi means “the incomparable one” and the plant is worshiped morning and evening, a Hindu household is considered incomplete without a Tulsi plant. Apart from the religious significance of Holy Basil, the plant has many medicinal benefits. In Ayurvedic medicine it is termed “the elixir of life” as it promotes longevity, in other words it has antioxidants which help boost the body’s ability to fight those nasty free radicals which cause disease and aging. It is also an adaptogen that helps the body fight stress by balancing the mind, nerves and emotions and maintains health of the respiratory tract. Initially I was curious why this customer wanted this tea. When I learned about the spiritual nature of Holy Basil, I could understand the importance of this tea and was thrilled to learn a bit more about another aspect of this beverage we love called tea.